Despite overcast skies, Discovery -- STS-121 -- landed at Kennedy Space Center (KSC) in Florida this morning on its first opportunity, right on schedule, bringing an end to an almost flawless 13-day, 5.3 million-mile mission to the international space station (ISS). Pilot Mark Kelly fired the shuttle’s engines at 8:07 a.m. local time or Eastern Daylight Time (EDT) to begin the shuttle's descent to Florida. Then, after what appeared to be a fairly textbook re-entry, and following the trademark two sonic booms, Discovery touched down at 9:14 a.m. EDT (6:14 a.m. PDT; 13:14 GMT), rolling to a final stop 1 minute later. This was the second of 2 test flights since the Columbia disintegrated on re-entry in February 2003, and there were, no doubt, many sighs of relief as the shuttle came to a stop on runway 15. Although there had been a few pieces of foam that flew off during launch, and a few technical and equipment glitches, the mission went so well that it was extended by a day. By most all accounts, STS-121 was nearly flawless in achieving all its objectives -- delivering European Space Agency (ESA) astronaut Thomas Reiter, as well as supplies to the station, and preparing for the completion of station assembly. "It's such a great day I don't think even a press conference can destroy it," said NASA Administrator at the post-landing press conference. "It's as good a mission as we've ever flown, but we're not going to get overconfident . . . and we're not going to get ahead of ourselves." Griffin noted that in addition to completing the ISS, NASA planned to launch a mission to repair the Hubble Space Telescope, although he would not confirm any date for that mission. In its initial landing approach, Discovery glided at slope of 20 degrees, more than 6 times steeper than the 3-degree slope of a typical commercial jet airliner as it approaches landing. 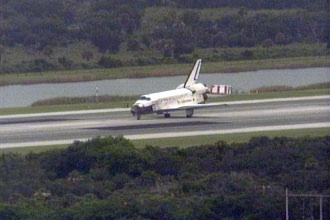 The orbiter touched down on the surface of the Shuttle Landing Facility at KSC at more than 200 miles per hour. The runways at this facility are 15,000 feet long and 300 feet wide, much larger than most commercial runways. For comparison, consider that the longest runway at Los Angeles International Airport (LAX) is 12,091 feet long and 150 feet wide -- 2,909 feet shorter and 150 feet narrower than those at the Shuttle Landing Facility. Although it is used by military and civilian cargo carriers, astronaut T-38 trainers, shuttle training aircraft and helicopters, the facility was specifically designed back in the 1970s for end-of-mission shuttle orbiter landings. The Expedition 13 crewmembers that Discovery left behind at the ISS -- Commander Pavel Vinogradov, Flight Engineer and NASA Science Officer Jeffrey Williams, and Flight Engineer and Reiter -- watched the shuttle land from on orbit. Reiter's arrival marks the first time the ISS has had a 3-person crew since 2003. Discovery launched on July 4 into blue skies, the first shuttle ever to launch on Independence Day. Even though 5 pieces of foam had fallen from the external fuel tank -- one of which definitely hit the shuttle -- none of the pieces came off during the early part of the launch and the one that hit the shuttle did not hit any sensitive areas on the spacecraft.